Mazda are to unveil a new Mazda MX-5 Miata 25th Anniversary Edition sportscar later today at the New York International Auto Show. This special edition model was created to celebrate 25 years since the launch of Mazda’s iconic roadster at the Chicago Auto Show in the USA In 1989. 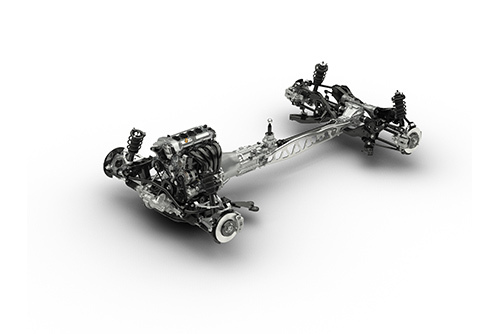 Mazda will also reveal their newly-developed SKYACTIV-Chassis forms the basis of the next generation (all-new) Mazda MX-5. Since its launch in 1989, the Mazda MX-5 has consistently offered lightweight, affordable and accessible sportscar fun, winning a huge amount of fans around the world. More than 940,000 units have been produced so far (as of end March 2014) and the model holds the Guinness World Record for the best-selling two-seater sportscar. 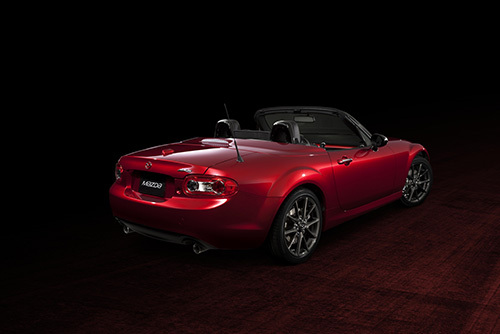 The special edition Mazda MX-5 25th Anniversary Edition is based on the 2.0-litre 157bhp Roadster Coupe model, with that cars power retractable hard top and either a 6-speed manual or automatic transmission. It is available in any colour as long as it’s Soul Red Metallic. Exterior highlights include a brilliant black-painted roof, A-pillars, and door mirrors, Bilstein dampers and 17-inch Dark Gunmetal alloy wheels.. 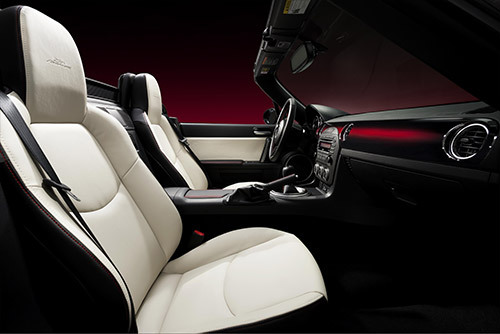 While inside the car sports off-white leather seat upholstery and door trim, hand-finished dashboard decorative panel in Piano Black. Mazda will also reveal the newly developed SKYACTIV-Chassis that will be used for the upcoming next-generation, all-new Mazda MX-5. It will be the first time that SKYACTIV technology has been displayed in a front-midship-engine layout and rear-wheel-drive configuration. Mazda aren’t giving away much about the new MX-5 but do say that the new car will feature be the most compact configuration of any generation of the MX-5 and that the engine will be located closer to the vehicle’s centre and mounted lower. They have also paid particular attention to improving body rigidity and crashworthiness, while reducing weight by more than 100kg over the previous model. 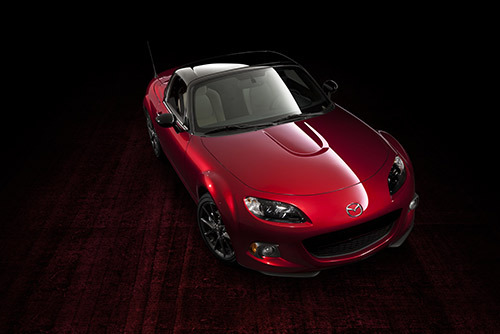 The new Mazda Mx-5 is expected next year (2015) and has the ingredients of a fantastic drivers car. With the MX-5 sports car still as popular as ever, who would bet against us celebrating the half-century in 25 years time?